Welcome to my first article at RotoBaller. I’m thrilled to be part of the team and look forward to giving our readers some quality advice. With games being spread out throughout the day, we’re going to provide numerous FanDuel plays to help anyone who wants to play either slate. 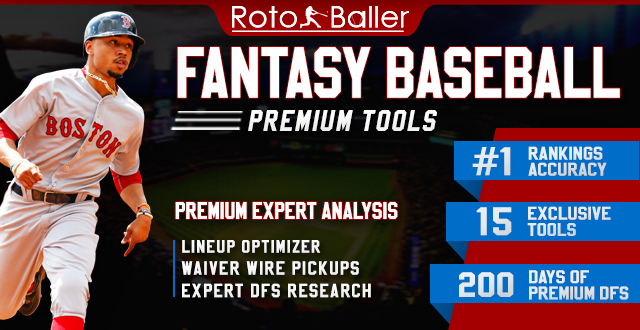 In this article, I will be providing you with my daily fantasy baseball lineup picks for FanDuel on 4/13/2019. The lineup picks will range from some of the elite players to mid-priced options and value plays. While we do have a lot of clouds in the sky for Saturday’s slate, it looks like there’s really only one game we need to worry about. What makes that annoying is the fact that it’s the game we want to stack, with the Texas Rangers playing host to the Oakland A’s. While there is rain in the forecast, it’s projected to end about 2-3 hours after the first pitch. It’s unclear exactly how much it’s going to pour but it’s something we need to monitor prior to submitting lineups. Not to mention, that’s the only game with really heavy winds and they happen to be blowing out to right field. While we’re not worried about these games, it’s also a good idea to keep an eye on Boston, Minnesota, New York and Kansas City, as all four cities have a projected overcast sky and a chance of light rain. Snell is the highest priced player on the board and rightfully so. After a nightmare opening start, Snell has bounced back big time by collecting 24 strikeouts across his last two starts. He allowed just one combined run in those starts while averaging 64 FanDuel points per game. That’s simply ridiculous production, and he should have success against a Toronto offense who owns a .280 wOBA this season. Not to mention, the Blue Jays currently sit 26th in OPS while owning the second-worst strikeout rate in the majors. This may be one of the final times Pineda’s price remains below $9,000, as it appears he’s recaptured his pine tar days form. After throwing just 40 pitches in the opener, Pineda doubled that total with 80 in his most recent start. In those nine-total innings, Pineda has allowed just seven base runners and two earned runs while striking out 10 batters. The huge increase in pitches would indicate that Pineda is ready for 90-plus here, as he enters this matchup as a –195 favorite. The Tigers projected run total is actually below 3.5 runs too, and their .257 wOBA is easily one of the worst marks in the league. Not to mention, they currently rank fourth in total strikeouts. Going off of BvP is dangerous but there’s something to be said when it’s a guy like Votto. Not only does Votto have one of the best eyes and minds in baseball, but he’s also seen Adam Wainwright 54 times throughout their long careers. In those 54 at-bats, Votto is posting a .424 wOBA and .283 ISO en route to an OBP north of .400. That’s all you can ask for, as Votto should abuse a diminished Wainwright. Over the last three years, Wainwright has posted a 4.77 ERA to go along with an unsightly 1.45 WHIP. Is this guy nuts? He’s going to use BvP for two guys? Yeah, this is one of the rare occasions where we get a good sample size, as Altuve and Felix Hernandez have been going at it for years. While this sample size is a bit smaller, it’s hard to argue with a .483 average and .553 wOBA in 29 at-bats. Much like Wainwright, Hernandez simply isn't the same pitcher he once was. In fact, Hernandez has posted a 5.50 ERA and 1.39 WHIP dating back to last season. That paired with the fact that Altuve is scorching hot right now makes him tough to avoid, with Altuve averaging close to 30 FanDuel points per game across his last five fixtures. Ramirez really hasn’t given us much reason to use him with his recent form but this price is simply ridiculous. Ramirez was a player in the $5,000-range for the majority of last season, as he finished top-three in total fantasy points. This sort of discount is really difficult to overlook, especially in this sort of matchup. Homer Bailey is currently allowing an absurd .426 wOBA this season, which followed up an ugly 2018 in which he allowed a .377 wOBA. Despite the struggles, let’s bank on Ramirez getting out of this slump in this superior matchup. Using Dodgers is a profitable strategy against Zach Davies but Seager is really the only discount in the bunch. Davies just hasn’t been the same against left-handed batters, allowing a .779 OPS against them over the last three years. That spells disaster against a lineup like this, as Cody Bellinger, Max Muncy, and Seager could go ham. Seager’s splits speak for themselves, as he’s posting an .884 OPS against right-handers in that span. It’s the price that we really like though, as Seager is typically in the $4,000’s when he’s right. Seager is scorching the last few days too, going 4-for-5 at the plate, while accruing two doubles, three runs, and two walks. This is a pretty simple play, as Davis has five dingers over his last three games to give him a league-leading 10 homers for the season. That alone would make him worth using but this situation is hard to overlook. Davis goes absolutely nuts in Globe Life Park, as his career OPS is north of 1.200 in that ballpark. Not to mention, he faces Adrian Sampson, who allowed a .351 wOBA last season. Using home run hitters against Marco Estrada is always a good idea. The main reason for that is because Estrada owns a career HR/9 rate just below 1.50. That’s obviously not good and it spells disaster against a guy like Gallo. Not only does Gallo lead the team with an xwOBA of .369, but he also has nearly 50 dingers dating back to the beginning of last season. Choo should lead off against Estrada and it’s hard to overlook this spectacular matchup. Not only does Texas have the highest projected run total on the slate, but Choo has also made minced meat of righties throughout his career. In fact, Choo owns a .393 OBP and .884 OPS against right-handers throughout his tenure. That spells disaster for Estrada and Choo should benefit from all of these projected runs.